The Chichaqua Valley Trail is a converted rail-trail traveling twenty-six miles through several small Iowa communities, forested corridor, and open farmland. The concrete/ asphalt trail changes to crushed gravel north of Mingo. South of Berwick cyclists can connect with the High Trestle Trail, Neal Smith Trail or Heart of Iowa Nature Trail via Ankeny or pedal to Pleasant Hill and Altoona. 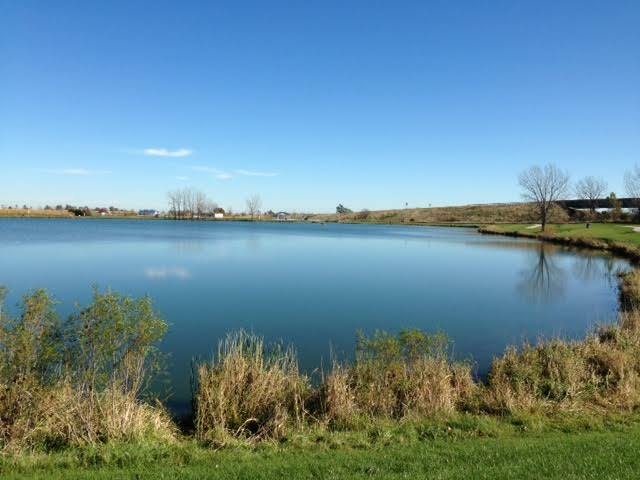 Lake Petocka serves as a nice trailhead for a family ride. A cement path surrounds the lake for young riders to enjoy. There is ample parking along with a playground and picnic shelter. November days filled with sunshine and warm temperatures are a treasured treat . They bring a sense of urgency and a heightened need to get outside. Because, you never know, it could be The Last Good Day Before Winter! The logical remedy is to find a bike trail, savor a ride and create memories to tap when tolerating the cold months of winter. For me, what to do on this beautiful day was a no-brainer. My husband also knew how he was going to spend his time outside. But my son? He had a BIG decision to make. Bike or fish? As tempting as it was to lobby for my favorite hobby I kept quiet and waited for the verdict. Would it be fish for trout with Dad at Lake Petocka or ride with Mom on the Chichaqua? Two bikes were loaded up along with one fly rod and we headed to Bondurant. Using the park as our trailhead, the plan was an out-n-back to Valeria. This is an easy stretch of trail. It's in fantastic condition and runs flat. And the scenery...in the fall it's beyond beautiful. An ape spray painted on the back of a trail sign. A snake that survived being run over by a mountain bike. A paper wasp nest hanging from the branches of a Sycamore tree. A leaf bigger than a bike bag. One mile of our ride passed through public hunting area. With bird season underway we chose to wear our "don't shoot at me orange". Hunters are required to either case or disable their guns before entering the trail and hunting is prohibited on the trail right of way. Reaching Valeria we took a bike break and enjoyed a snack while watching some nearby cows. Then a question was posed. Who would be faster? A sprinting cow or Mom on her bike? Time to head back to the park. Fred and Doris* were going to spend the morning together. What would they do? If he could pick, Fred would spend his free time fishing, but he knows how much Doris likes riding her bicycle so he graciously offered to go on a ride. To the Chichaqua Valley Trail they went. They began their ride at the fantastic trailhead in Bondurant. Right away Doris (because she's so very observant) noticed something new. It was sidewalk art by Chris Vance inside the picnic area. Doris was happy to discover something cool and new. Wearing attire that would make "serious" cyclists cringe, the duo headed out on the trail. Fred asked Doris if she would like to ride a loop around Lake Petocka. He explained how this lake was stocked with trout in the spring. Doris then understood why he wanted to pedal around the lake. Fred's always scouting for the next fishing spot. Their ride out-n-back to Valeria was a peaceful and pretty one. Doris teased Fred about his loud brakes. Fred teased Doris about the amount of random stuff stowed away in her handlebar bag. 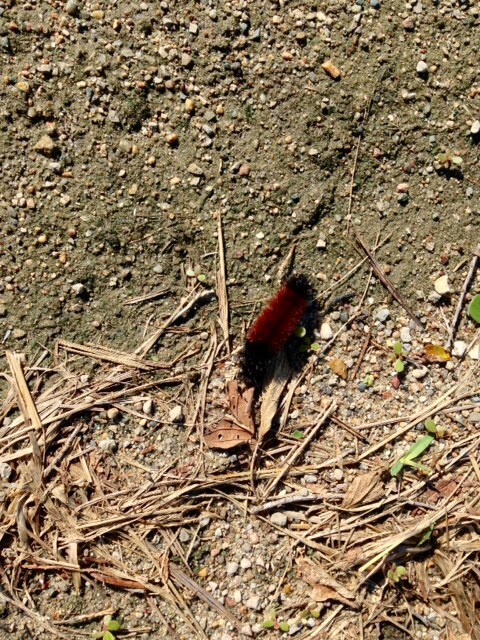 Wooly caterpillars were spotted on the trail. Doris reminded Fred how folklore says the wider the middle brown section the milder winter will be. Fred was happy to see lots of wide middle brown sections. East of the trail at NE 82nd street Fred and Doris noticed something they hadn't seen before. It was an deck overlook next to Santiego Creek. Doris was happy to discover something cool and old. Returning to Bondurant, Doris asked Fred if he would like to get lunch at Brickstreet Street Market and Cafe. She explained they have the best tenderloin sandwich in Iowa. Fred then understood why she wanted to ride the Chichaqua. Doris is always scouting great places to eat along the bike trail. After lunch it was time to head back home. Fred and Doris were tired. They were full. But, most of all they were happy. Happy to spend a morning together out on the bike trail. *My nickname for my husband and I. We're "uncool" cyclists who embrace our "fredness". Learn more about what makes someone a Fred or Doris here. 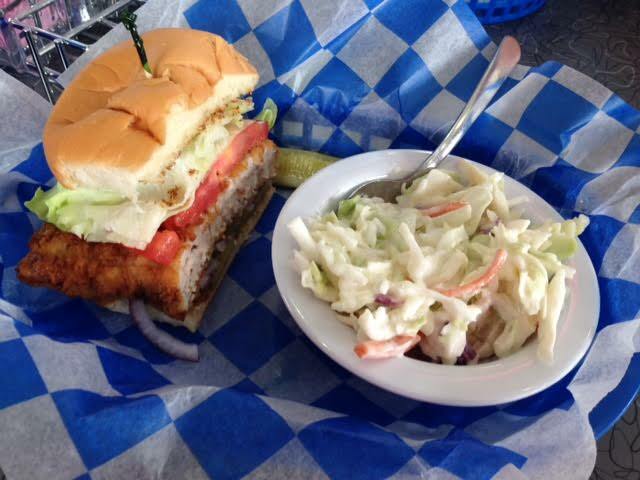 A bike ride with a prize winning tenderloin sandwich as the destination? Count me in! My siblings had not yet ridden the new Chichaqua trail segment from Berwick to Bondurant. Having heard about the fantastic pork sandwich at the Butler Cafe in Bondurant, the idea to ride to Brick Street Market was hatched. Our bike ride began at Mally's Park. It's a quiet spot in the heart of Berwick with a picnic shelter, water fountain and restroom. A direct connection to the trail from inside the park doesn't exisit (yet) but it's easy to catch up with the trail out on NE Berwick Drive. Early July can be a super busy time out on Iowa's bike trails with folks getting miles in on the bike in preparation for RAGBRAI. Everyone we encountered looked to be out for a leisurely ride rather than training. 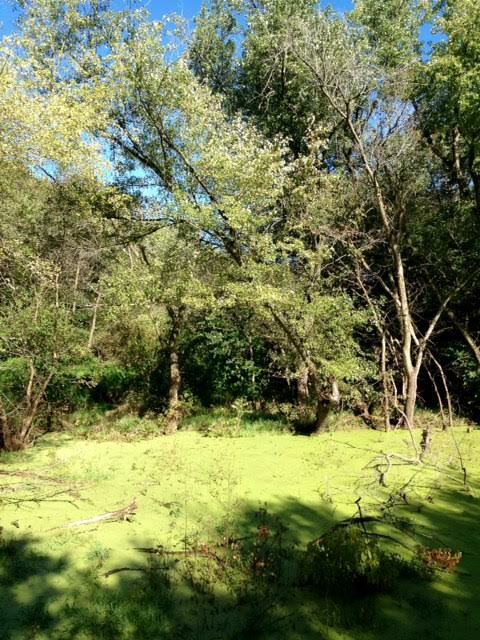 The Chichaqua just might be a "quieter" trail to enjoy this time of year. New concrete and no hills made the pedal to Bondurant an easy one. We stopped at the trailhead for a quick break before heading through town to the market. Bike parking is not available at the store so we stowed our bikes next to the building and ventured inside to enjoy our lunch. The reviews were right! It was the best pork tenderloin I've ever had. It was tempting not to try other items like the root beer sundae or the malted waffle. What we didn't order was The Brick. This mammoth sandwich costs $29.99, but if eaten in less than 15 minutes is free, along with a t-shirt. 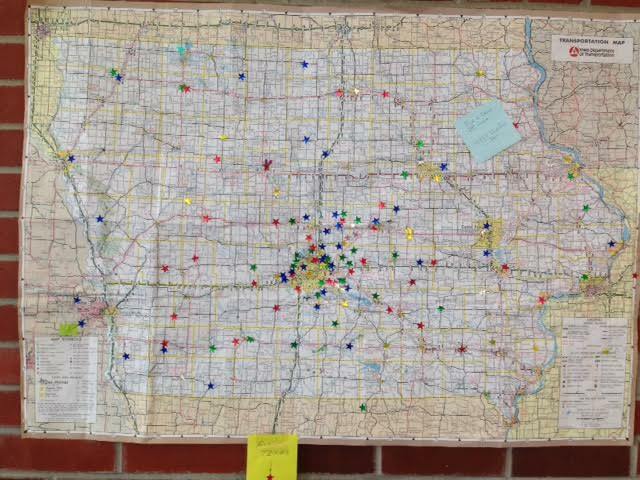 Folks travel from all over Iowa to eat at the Butler Cafe. Hopefully those who take the food challenge pedal off some calories out on the bike trail. But I doubt 26 miles is enough to burn them all. But, if you ride on to Woodward via the High Trestle Trail they just might! 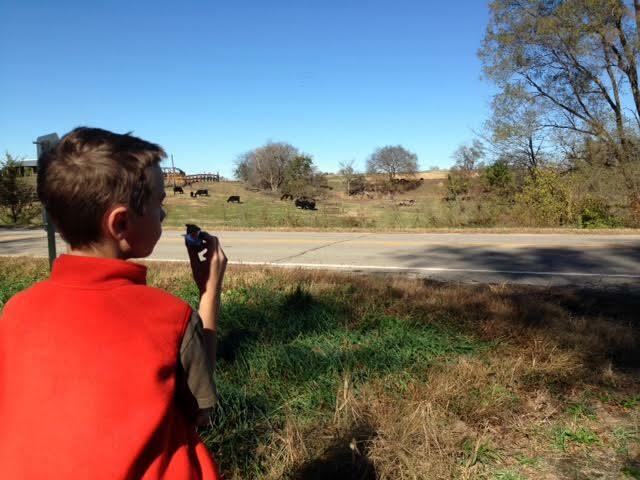 Built in 1987, this twenty-six mile route is only minutes from the Des Moines metro. It travels through several small communities, forested corridor, and open farmland. The converted rail-trail has minimal grades. It is mostly asphalt, changing to crushed gravel outside of Mingo and a new concrete link from Bondurant to Berwick. The new trail segment connecting was officially open. Time for a ride! I chose to use Mally's Park as my trailhead. This quiet spot was donated by the Mally family and has ample parking, a picnic shelter, and restrooms. There isn't a direct connection to the trail from inside the park so I rode back out the driveway to NE Berwick Drive and caught up with the trail. Just up the trail from Berwick is Griffs Valley View RV Park. The horse statue at the park entrance is sure to become a popular photo op for those out for a bike ride. With over 140 places to camp, pond fishing, and now easy access to the Chichaqua Valley Trail, there's lots of ways for having a relaxing time at the park. 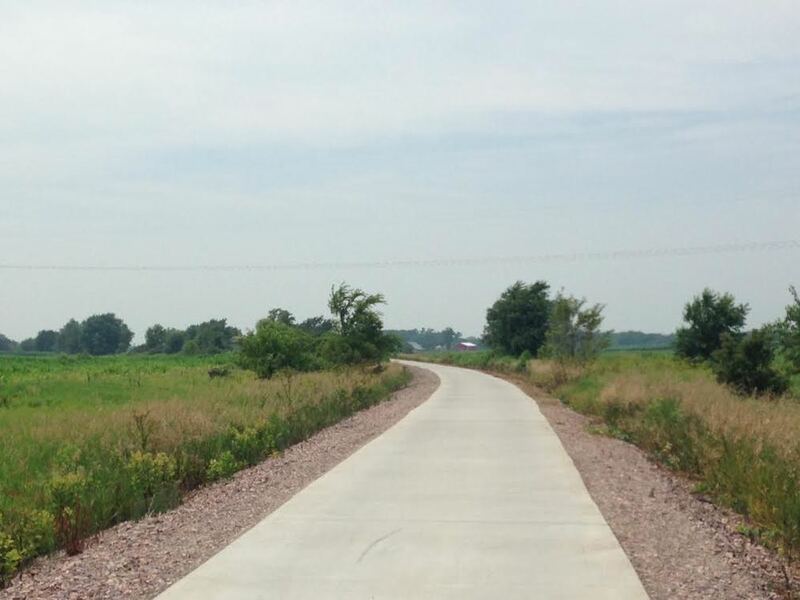 Heading towards Bondurant, the new trail segment travels thorough open farmland. While it runs flat, Iowa's wind will be sure to make an appearance and provide it's own challenge. The beautifully restored depot greeted me as I reached Bondurant. It's one of the prettiest trailheads I've seen. A antique clock reminded me of the time while a railway sign in the picnic area provided a reminder of the trail's origin. I took a quick pit stop before heading out of town to the "original" trail. Arriving at the trailhead location on NE 88th Street, the trail changes to asphalt. This link of the Chichaqua is the most scenic. The Sweet William was blooming in the Woodcock Wildlife area. It was so pretty! And the greens! So many shades of green in the emerging leaves of the tree canopy. My turn around spot for the ride was the tiny town of Valeria. This little community has an interesting background. A romance bloomed between a farmer’s daughter (Edna Valeria) and a railroad engineer. Edna convinced her father to allow the new railroad to cross their land. He agreed as long as the depot would be named after their family. Valeria was born. On the way back through Bondurant I took a detour off the trail to grab a snack at Brick Street Market and Cafe. It's a lovely grocery store with a diner style restaurant, deli, espresso drinks, and a patio outside to enjoy a beautiful day. With the new addition of the Chichaqua Valley Trail there are even more options for bike riding in central Iowa. Just south of Berwick cyclists have the choice of either riding to Ankeny to connect up with the High Trestle Trail, Neal Smith Trail or Heart of Iowa Nature Trail. Another available option is to pedal to Pleasant Hill or Altoona. What a perfect example of how a relatively small extension of trail can have such a huge impact. Only minutes from the Des Moines metro, The Chichaqua Valley Trail is a 20 mile out-n-back through a forested corridor traveling from Bondurant to Baxter. Originally the Wisconsin, Iowa & Nebraska Railway, this converted rail-trail is mostly asphalt, changing to crushed gravel outside of Mingo. It’s a flat trail with minimal grades. There are several stone bridges to cross built in the late 1800's by the former railway. The Bondurant trailhead is located just off Highway 65 on NE 88th Street. Work is underway to extend the trail into downtown Bondurant to the new trailhead. After a confusing false start in Bondurant (I thought the trail started downtown...eesh!) I chose to begin my ride in Baxter. Arriving at the trailhead I saw the wooden caboose. It’s over 100 years old and filled with historical artifacts from the surrounding area. Along the trail railway markers show the mileage to Kansas City. Mingo is the halfway point on the trail. It is also the start/stop point for the asphalt portion. Just before entering town I stopped on the bridge crossing the Indian Creek. This creek also runs only a few miles from where I grew up outside of Nevada. It has special memories for me. As kids my brother and sister and I would often ride our bikes on the gravel road to the creek to wade, explore, or just throw rocks into the water. South of Mingo the trail travels through the Woodcock Wildlife Management Area and crosses the South Skunk River. The bridge had a huge log jam under it along with lots of liter. Proof of how challenging it is to keep Iowa’s waterways clean! The trailside town of Valeria exists thanks to a romance between a farmer’s daughter (Edna Valeria) and a railroad engineer. Edna convinced her father to allow the new railroad to cross their land. He agreed as long as the new community would be named after their family. Reaching the trailhead outside Bondurant I took a short break and ate a granola bar. I spotted the construction for the trail connection to downtown. It will be nice when the project is complete. The new trailhead in Bondurant is a beautiful facility and will be sure to be a popular spot. My ride back was a challenge. I rode around Mingo looking for a convenience store for water and food. No luck. I pushed on to Ira where I found a water fountain. I got a long drink, filled my bottle, and soaked my bandana to keep me cool. I noticed a small refrigerator under the picnic shelter. It had been decorated and was keeping a collection of books safe and out of the elements. 40 miles by myself took for-ev-er!! When I finally reached the asphalt outside of Baxter I was relieved to know I was almost done. Packing up my bike and gear I decided that when I return to the Chichaqua I’ll either just ride the Bondurant to Mingo portion, or bring a friend for some company. The Bondurant trailhead has a kybo but no water, so make sure to fill up your water bottles before arriving. Riders choosing to begin their ride downtown Bondurant will need to navigate streets and country roads on their way to the trailhead east of town. Take it easy on the crushed gravel segment as it’s rough and bumpy, or just avoid it by beginning your ride at Bondurant and turning around in Mingo.